Adult spotted lanternfly (Lycorma delicatula). Source http://hojae.net/520. The Pennsylvania Department of Agriculture recently reported the first detection of yet another invasive hemipteran pest in the US. While efforts to have a good grip over other invasive hemipterans like the Asian citrus psyllid, the Bagrada bug, and the brown marmorated stink bug is still underway, there is a new pest that could potentially impact industries ranging from lumber to wine. An exotic pest known as the spotted lanternfly, Lycorma delicatula (White) was recently detected in Berks County, PA. 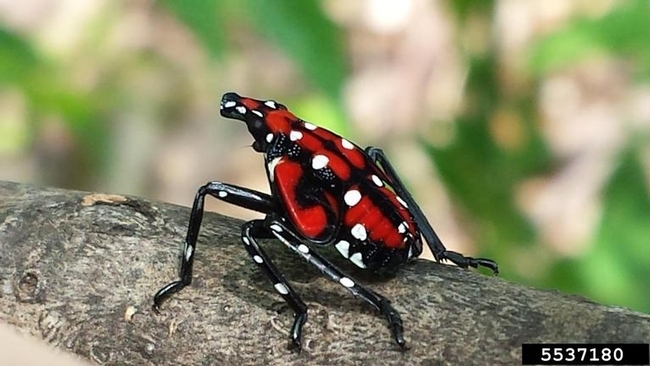 Spotted lanternfly, which is actually not a fly, but a planthopper is also referred to as “spot clothing wax cicada” or “Chinese blistering cicada” in the literature. It belongs to the family Fulgoridae in the order Hemiptera. Fulgorids or members of the family Fulgoridae are moderate to large planthoppers generally referred to as lanternflies because of the inflated front portion of the head that was thought to be luminous. Spotted lanternfly is regarded as a poisonous insect in Chinese medicine and used for relief from swelling. Spotted lanternfly is native to China and is present in Southeast Asia. It was first reported in South Korea in 2006 and rapidly spread to different parts of the country. Spotted lanternfly feeds on a variety of host plants including fruit trees, ornamental trees, woody trees, and vines. 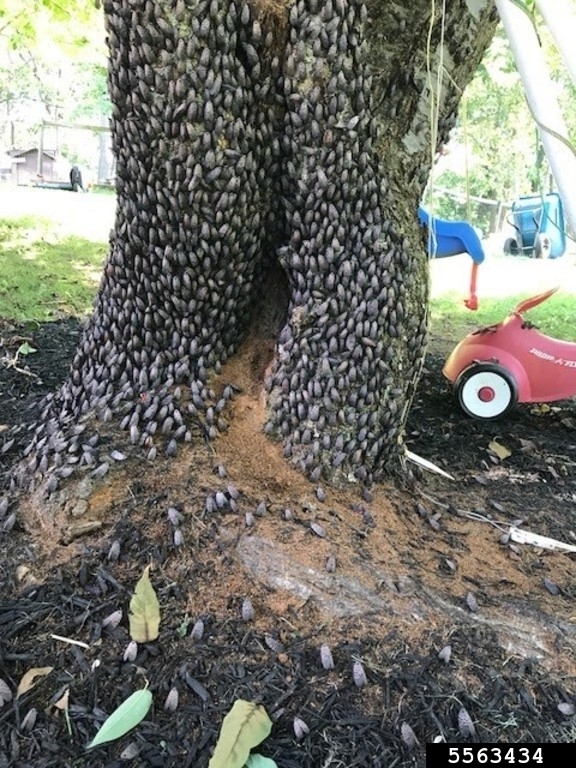 Apples, birch, cherry, dogwood, grapes, Korean Evodia, lilac, maple, poplar, stone fruits, and tree-of-heaven are among more than 70 species of hosts attacked by this pest. Tree-of-heaven, which contains high concentrations of cytotoxic alkaloids, is one of the favorite hosts. This is probably why spotted lanternfly is considered poisonous and used in traditional Chinese medicine. Other preferred hosts such as Korean Evodia (Bebe tree) are also used in oriental medicine suggesting that spotted lanternfly has a high preference for hosts that contain toxic secondary metabolites. 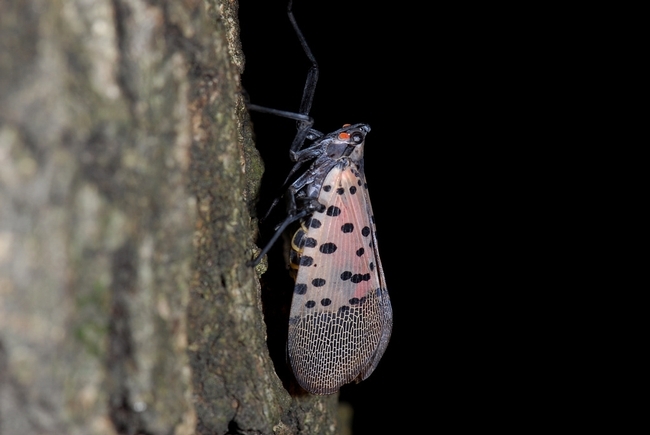 Observations in South Korea also indicate that spotted lanternfly appears to have a wider host range early in life as young nymphs and a narrow range as they grow older, especially before egg laying. Choosing plants with toxic metabolites for egg laying is thought to be a mechanism of defense to protect from natural enemies. 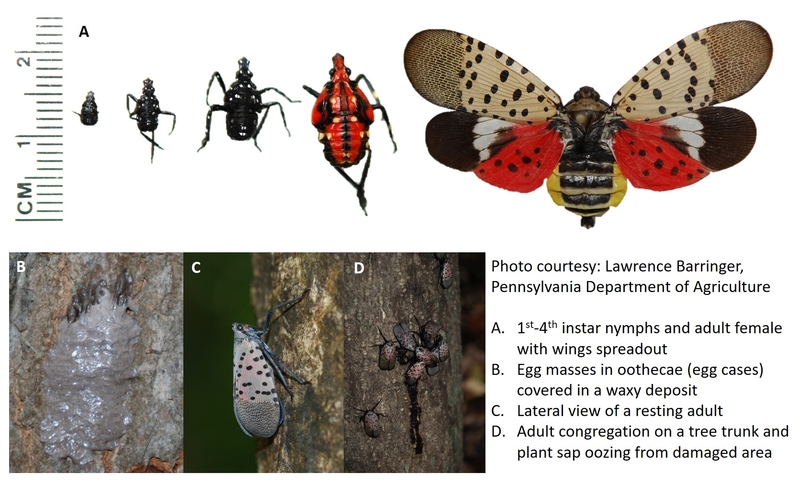 Although grape vine does not have toxic metabolites like these other hosts, spotted lanternfly showed a strong preference in studies conducted in South Korea. Sugar content of the host plant also appears to play a role in their choice with a preference for hosts containing high sucrose and fructose content. 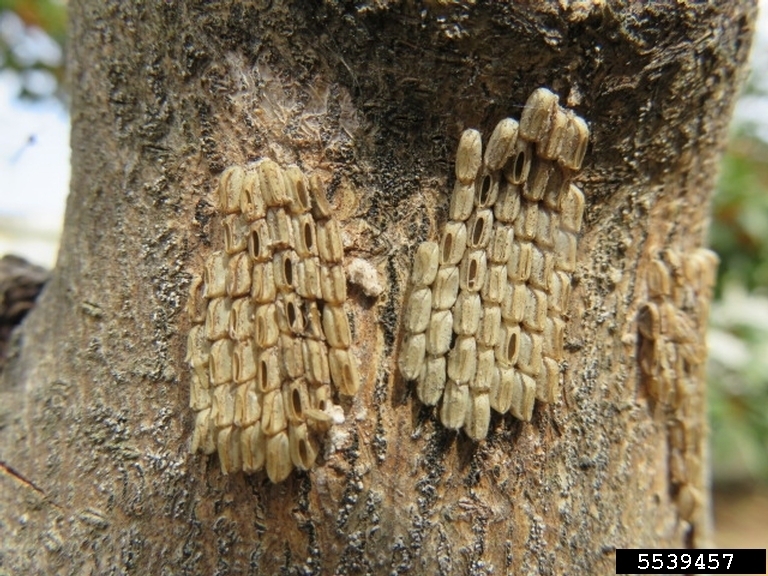 Eggs are laid on tree trunks in ootheca (egg case) in groups of 30-50 and are covered in a yellowish brown waxy deposit. Eggs usually hatch during the early hours of the day. Waxy deposit disappears on old egg masses which look like brown seeds. There are four nymphal instars. Nymphs have a black body. The first three instars have white spots while the fourth instar has red wing pads and upper body. Nymphs start climbing up the trees after they emerge and fall off when there is a physical obstacle or disturbance from wind or other factors and start climbing up again. This falling and ascending cycle is thought to be a means of host selection and dispersal. Adult males are 20.5-22 mm (0.81-0.87 inches) long from head to the end of the folded wing and females are 24-26.5 mm (0.94-1.04 inches) long. Forewings are greyish with black spots in different patterns. Part of the hind wing is red with black spots and the rest is white and black. Tips of the wings show a network of veins (reticulated). Abdomen is yellowish with black bands. Legs are black and have white spots during nymphal stages. Length of the legs varies from 15-18 mm (0.59-0.71 inches) in adult males and 18-22 mm (0.71-0.87 inches) in adult females. Adults are weak flyers, but good hoppers. Head is black with piercing and sucking mouthparts. Life cycle is typically univoltine (one generation per year) and spotted lanternfly overwinters as eggs. Adults and nymphs feed on phloem tissues of foliage and young stems with their piercing and sucking mouthparts and excrete large quantities of liquid. 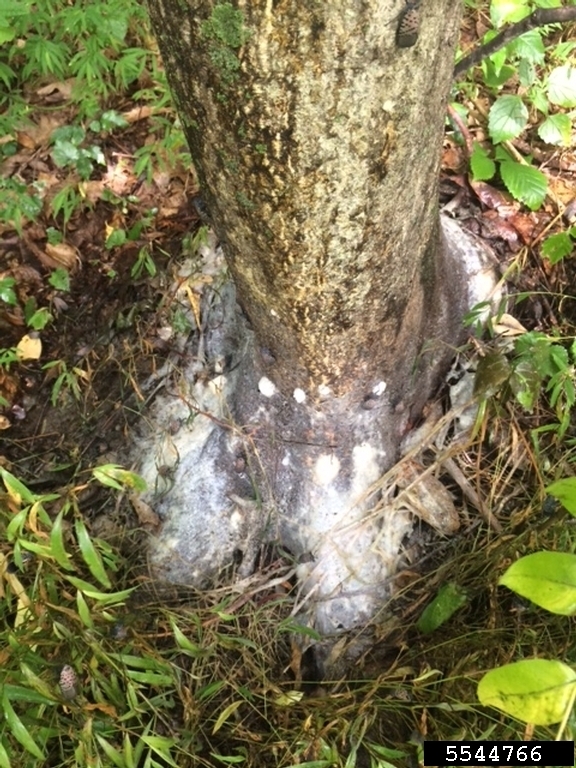 Due to the sugar content of the liquid, plant parts covered with spotted lanternfly excretion harbor mold growth, which could hinder plant growth or even cause death. Neonicotinoids, pyrethrins, and organophosphates are among the chemical insecticides effective against spotted lanternfly. Adults and 2nd-4th instar nymphs appear to be attracted to spearmint oil which could be used in their control. Using sticky traps at the base of the tree trunks also appears to be a good management strategy. 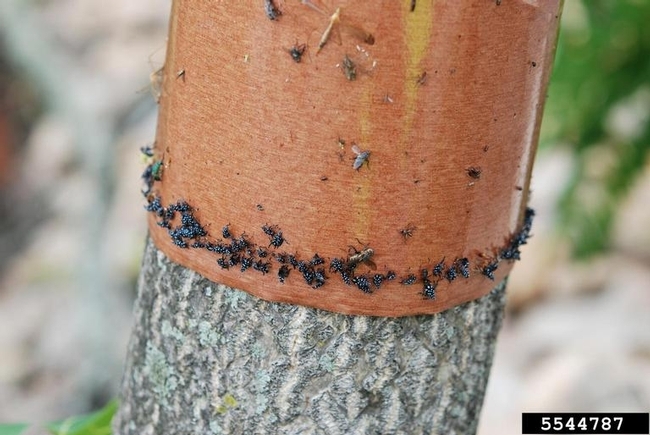 Parasitic wasp, Anastatus orientalis is reported to parasitize up to 69% of spotted lanternfly eggs in China. This egg parasitoid is considered a potential biocontrol agent for release against the spotted lanternfly in South Korea. Barringer, L. 2014. Pest alert: Spotted lanternfly, Lycorma delicatula (White) (Hemiptera: Fulgoridae). Pennsylvania Department of Agriculture. Choi, M.-Y., Z.-Q. Yang, X.-Y. Wang, Y.-L. Tang, Z.-R. Hou. 2014. Parasitism rate of egg parasitoid Anastatus orientalis (Hymenoptera: Eupelmidae) on Lycorma delicatula (Hemiptera: Fulgoridae) in China. Korean J. Appl. Entomol. 53: 135-139. Han, J. M., H. Kim, E. J. Lim, S. Lee, Y.-J. Kwon, and S. Cho. 2008. Lycorma delicatula (Hemiptera: Auchenorrhyncha: Fulgoridae: Aphaeninae) finally, but suddenly arrived in Korea. Entomol. Res. 38: 281-286. Kim, J. G., E.-H. Lee, Y.-M. Seo, and N.-Y. Kim. 2011. Cyclic behavior of Lycorma delicatula (Insecta: Hemiptera: Fulgoridae) on host plants. J. Insect Behav. 24: 423-435. Frantsevich L., A. Ji, Z. Dai, J. Wang, L. Frantsevich, and S. N. Gorb. 2008. Adhesive properties of the arolium of a lantern-fly, Lycorma delicatula (Auchenorrhyncha, Fulgoridae). J. Insect Physiol 54: 818– 827. Moon. S.-R., S.-R. Cho, J.-W. Jeong, Y.-H. Shin, J.-O. Yang, K.-S. Ahn, C. Yoon, and G.H. Kim. 2011. Attraction response of spot clothing wax cicada, Lycorma delicatula (Hemiptera: Fulgoridae) to spearmint oil. Korean Soc. Appl. Biol. Chem. 54: 558-567.